A man who caused the death of a cyclist by knocking him off his electric bike has been jailed for a year. Frank Lee, 81, fell from his bike when he was clipped by the wing mirror of Andrew Lanham's Ford Focus on a Cumbrian lane in February last year. Mr Lee died in hospital more than six months later from complications caused by his injuries. 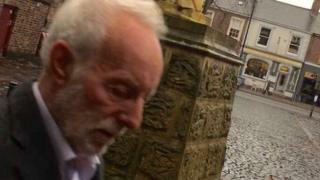 Lanham, 71, of Penruddock, near Penrith, was found guilty of causing death by careless driving. A jury at Carlisle Crown Court cleared the retired tree surgeon of an alternative charge of causing death by dangerous driving. Lanham had approached a Keswick-based group of cyclists on the single-track C3031 between Matterdale and Greystoke, the court heard. After overtaking two of the group, he sounded his horn "four to five times" before driving past Mr Lee, who was wearing a helmet. Police were told Mr Lee did not deviate from his straight riding line and was knocked off his bike as Lanham went by. Lanham told jurors he thought it was safe to overtake, but admitted: "I think it was an error of judgement." Also imposing an 18-month driving ban, Mr Justice William Davis told him: "You took a risk. "You overtook those cyclists one by one when you were driving far too close to them." In a victim impact statement, Mr Lee's 75-year-old widow Doreen described the retired barber as "considerate, kind, loving, optimistic and someone who had a real zest for life". She added: "He was my soul mate."